Bring classic style to your bedroom, living room or home office with a richly-dimensional Safavieh Cambridge Rug. Artfully hand-tufted, these plush wool area rugs are crafted with plush and loop textures to highlight timeless motifs updated for today's homes in fashion colors. Cambridge Rugs by Safavieh represent beauty in the simplest form, featuring elegant transitional patterns combined with soft tones to create a rug that can complement just about any environment. The Chatham collection by Safavieh contrasts ancient Moroccan motifs with a fashion-forward palette of bright and pastel colors. This transitional and contemporary rug offers a thick wool pile in modern designs to complement any home decor. These stunning hand-tufted wool rugs are crafted in India to recreate the elegant look of hand-knotted carpets for today's lifestyle interiors. This is a great addition to your home whether in the country side or busy city. The Montauk collection captures the essence of casual designer styling in flat weave rugs that complement homes from coastal to contemporary. Hand-crafted in India of cotton for clarity of colour, Montauk rugs are woven to create classic Ikat tie-dye effects. This is a great addition to your home whether in the country side or busy city. 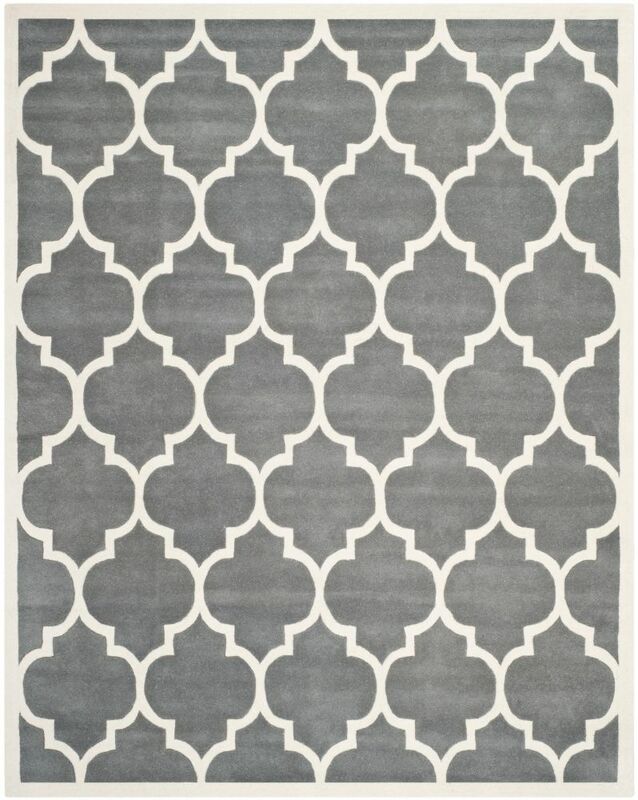 Chatham Caprice Dark Grey / Ivory 8 ft. x 10 ft. Indoor Area Rug The Chatham collection by Safavieh contrasts ancient Moroccan motifs with a fashion-forward palette of bright and pastel colours. This transitional and contemporary rug offers a thick wool pile in modern designs to complement any home decor. These stunning hand-tufted wool rugs are crafted in India to recreate the elegant look of hand-knotted carpets for today's lifestyle interiors. This is a great addition to your home whether in the country side or busy city.